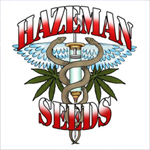 Hazeman Seeds - White Tiger. Free US delivery. Hazeman's White Tiger is a strong plant that you can't tame! This is a strong plant that grows medium to tall and has the punch of a great white shark. Mr. Nice's White Shark female was hit with the power full Aloha White Widow male to create this strain. White Tiger flowers in 8 to 10 weeks producing some nice white pine cone nuggets. The effect is relaxing.